Homemade All The Way, Or The Easy Route? Before we get into all the fun decorating and accessory ideas for your gingerbread house, you have to decide what the base of the houses are going to be made of. You can keep it traditional and go with homemade icing and homemade gingerbread pieces. This is usually a tastier option and it’s fun knowing that everything on your house was crafted with care by you. Then, there is the easy route: using graham crackers and pre-made icing for your base. Of course, this is just as tasty, and a lot less time-consuming. Once you have decided on the base, you can decide what kind of house you would like your gingerbread house to be. It can be simple, elegant, fun, or even a little country. For a twist this holiday season, consider making a truly unique gingerbread house by using pretzel rods to make a gingerbread log cabin. 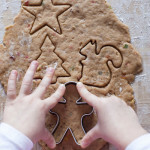 Simply cut off the ends at an angle to make them look a little more like logs, then use frosting to paste them to your gingerbread or graham-cracker walls and roof. You can use smaller pretzels for the finer details, like windows. Take a pointed ice cream cone, dye your frosting green, put it in a decorating bag with a fun decorating tip, and apply the frosting to the ice cream cone to look like a Christmas tree. Then, sprinkle powdered sugar over your Christmas trees to make it look like it just snowed. See an example of this tree here. Decorating Tip: It helps to start from the bottom and work your way up. If your frosting is a little soft, it might melt a little or sink down a bit. Another fun way to decorate your gingerbread house is with grape stems. Simply take a leftover grape stem, dip it in melted chocolate, and then dip it into a bowl of rice Krispies that have been mixed with green dye. Make a frosting lake or pond to go next to your gingerbread house and Christmas trees. Simply form a base out of cardboard or a large platter and cover it with tin foil. Then, mix blue food coloring with frosting, and use it to make a little lake next to your gingerbread house. Want your gingerbread house to look like your house on Christmas Eve, all lit up with twinkling lights? Make some candy Christmas lights using Mike & Ikes or Peanut Butter M&Ms. Here is an example of what these lights can look like when they’re done. No matter what you do this season, gingerbread houses are fun to make and delicious to eat for both young and old alike. 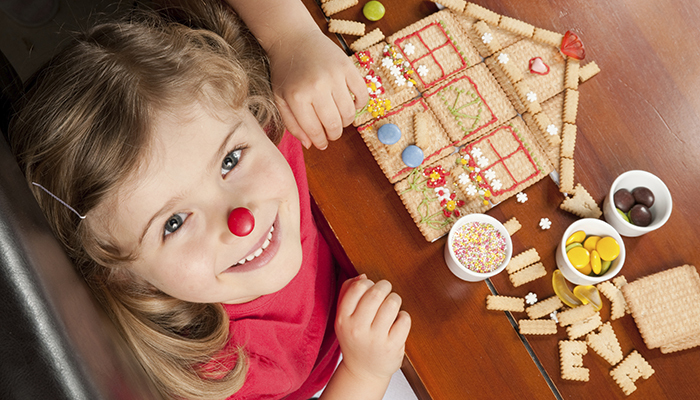 Get creative this year, and try some new gingerbread-house ideas. You may even be inspired to make a few as gifts for the special little ones in your life.